"Today, 80% of business is conducted on unstructured information" about customers, competitors, partners, products and suppliers which causes a huge wastage on paper, box files, storage space and manpower. The effectiveness of how this information is managed directly impacts an organization’s business and its operating cost. CFM TOPPAN FORMS provides a range of document management solutions and services that help you to manage your company data or business documents more efficiently. 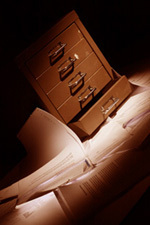 All documents are processed in a secured environment to ensure confidentiality throughout. We are able to integrate this seamlessly with your existing document management process. Your documents can be captured and indexed in a well-constructed way and have them stored in a cost effective storage media such as CD-ROM or DVD-ROM. Which you can sort, share, manage and transfer information easily within your organization. Alternatively, you can opt for web hosting (with password protection) that gives you the flexibility to retrieve your documents online. This service gives you all the flexibility of a hosted solution, unlimited document retrievals, to view or print as required, at your convenience. Digitize your documents to streamline your document management process now. Free yourself or your staff from the burden of handling large valumes of paper document and focusing on critical business process. You will be able to see measurable results in no time.